A free standing brick pier (or isolated pier as it is sometimes called) is a pillar of brickwork not connected to a wall. It can be used to carry the ends of beams to form a pergola, the base of a sundial or bird bath, or for hanging garden gates. Piers vary in size (both in width and height) and types of bond used. On this page we show a couple of simple stretcher bond piers, Both designs only use full bricks so there is no need for the bricklayer to cut any bricks. 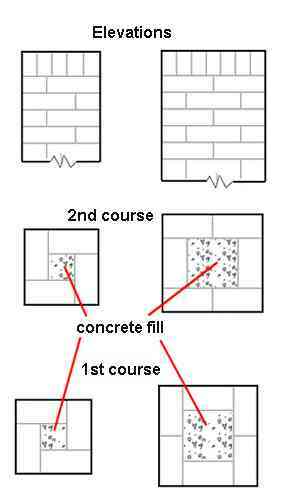 The bricks will leave a hollow centre which should be filled with concrete once the mortar has been allowed to harden (wet concrete will exert an internal pressure which could cause the brick mortar to fail if the concrete is inserted too soon). The centre concrete should be inserted in one go so that it can form one block from the base of the pier to the top without any weak joints within the concrete. If considered necessary, steel reinforcing rods can be inserted into the centre concrete fill.